Tara, are you the right intuitive reader for me? My readings are really focused on therapeutic insight (insight and information that has therapeutic value), meaningful guidance, helping the person I work with get some perspective on their situation, and helping my clients come away with more clarity and a sense of being empowered to effectively approach their lives. In my books, information and insight are distinct from each other. You can leave a reading with information, but fail to come away with insight. Insight is designed to offer you deeper, and new perspectives of what is happening in your life. Therapeutic insight takes insight a little further: it takes insight from something that is just intellectual, and turns into an embodied experience. Meaning, the insight gained helps you to release and heal on an emotional/energetic level, and helps you feel better. I work best with people who need to: i) understand their situations more deeply, ii) shift their perspective iii) start the process of emotional healing iv) integrate spiritual and life lessons v) reveal and connect with their own internal wisdom and vi) participate purposefully and consciously with their own power to create the outcomes that they want. If you are looking for someone to tell you what will happen and what you want to hear (as opposed to what you need to hear), then I am not the right match. Sessions with me often challenge your perspective, and they work best with people who would like to take more responsibility for their lives, thoughts and beliefs. Tara, why do you ask for information about my situation when you do a reading? I don’t know everything about you – nor should I. Having a sense of what is going on with you helps me to contextualize the intuitive information that I receive, thereby making the reading more relevant and much more useful to you. It also ensures I do not spend (waste) an inordinate amount of time figuring out what is going on (when you already know), so that we can spend most of the session getting the insight, higher perspective and guidance that is needed. One of the best analogies I’ve heard is this: going to the doctor. You don’t just turn up at the doctor’s office and say, “well, you’re the doctor, you tell me.” You don’t turn up at the doctor, refuse to explain your symptoms, and leave the doctor to figure out whether the pain is in your earlobe or in the big toe of your left foot. Instead, you let the doctor know where you experience a sense of discomfort and/or pain. This fast-tracks the doctor’s ability to get to the heart of your problem. An intuitive reading is very similar. Intuitive readings with me involve dialogue, and require your participation. They are not one-directional flows of information from me to you. Tara, do you predict the future? No. Sometimes, for whatever reason, more specific information about the future may come up (for example, a reading may suggest strongly that your landlord may not continue a rent agreement, and it would be best if you prepare to leave where you are). More specific information means that from an energetic perspective, the probability of something occurring is high, and if it comes up, it means that it is useful for you to be aware of in the present. Rather than delivering “predictions”, my readings will include information about the general trajectory of a situation, or where you are headed in terms of your own evolutionary development. The purpose of this kind of information is to allow you to more meaningfully act within the present. The present is the energetic place from which you create your future. Future timelines are outgrowths of choices, beliefs, attitudes and emotions contained within the present. A reading may show you where you are headed, so that you can take action to change your approach in the present, thereby changing your future. Probabilities have varying degrees of strength, and whether they manifest physically depends on a whole series of factors: your own energy and attitudes, as well as the actions or choices of other people who need to be a part of your future experience. My readings are focused on you acting toward resolving your own energy in the present so that you can begin to experience more of the outcomes you desire. Tip: rather than asking “will I get married?” ask a question like “how can I bring about the kind of relationship I want?” In any case, the latter kind of question is built into the structure of how I approach a reading. Tara, can you do a general reading for me? I just want to see what comes up. Sure, yes, we can explore general themes and influences. However, for this to be most effective, I prefer that general readings are face-to-face sessions. I will still ask you for your own comments and perspectives on what is happening with you at the moment. An exploration of general themes and influences will often tend to generate more specific lines of inquiry. As a general rule, higher levels of intentionality and focus where questions are concerned tend to yield more nourishing and useful information during the course of a reading. Tara, what comes up in a reading? Whatever comes up is most relevant to you at the time of your reading. If you are going through an emotionally challenging situation that is taking up most of your attention, then there is a 99.9% chance that is what will come up. Readings reveal and explore what is in your field at the moment. Tara, what is the difference between an email and A face to face reading? They are two different animals, really. 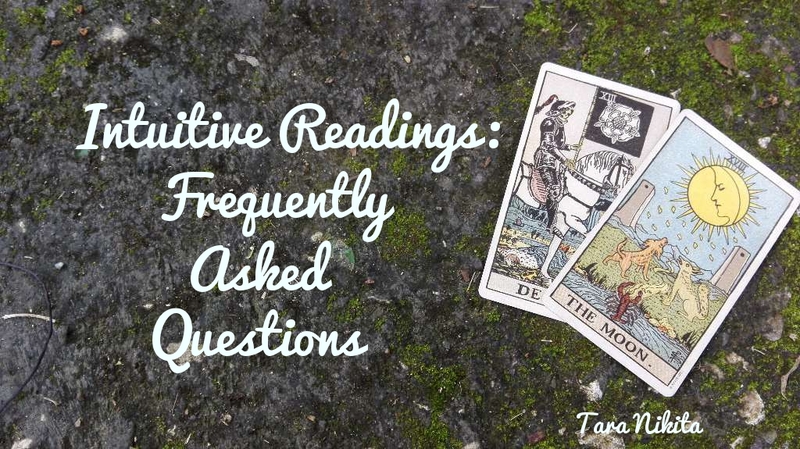 For email readings, I recommend that you have more specific sorts of questions, or specific lines of inquiry. In face to face readings, the process of the reading from start to finish has a therapeutic energetic effect. I include techniques that cannot really be applied in an email reading. In face to face consultations, there is obviously way more dialogue, and more input from you. If after filling out your intake form I see or feel that your questions are probably best suited for a Skype/face-to-face session, I will make this suggestion. Tara, what is the difference between your reading options? If you’re not sure which option to choose, go ahead with the “Classic Custom Reading” option, which allows me to tailor the reading to whatever it is you need. At the end of day, part of my job is to figure out the best approach to your reading, and the best approach to deal with what it is you want to explore. I will choose the approach that I feel is best suited for your scenario. Reading options are not set in stone. They are more like guidelines. Tara, how do I get a good reading with you? Here are a few tips: i) spend some time thinking about and feeling out what you want to explore during the course of your reading ii) approach your reading with an open mind iii) if you’re having a face-to-face reading with me, make sure you are not in a rush. This allows you to be focused on the here and now, and reap the benefits of your session – rather than spending the session thinking about where you have to be off to next! I prefer a thorough and in-depth approach, which does take time. TARA, HOW DO I BOOK A READING WITH YOU? To book an online reading with me, go here. If you’re in Jamaica, and you’d like a face to face session, go here. Or you can go directly to my online calendar to check my availability. Is my reader psychic enough?